Our CEO, Steve Fogue, has been interviewed by Fintech TV in London during our participation at Fintech Connect from the 5th -6th December 2018. Discover Particeep’s solutions and ambitions in this interview with our CEO Steve Fogue and English media outlet Fintech Finance. The One Week-One Tech initiative consists of an interview presented each week to challenge and promote the French Fintech. Discover the ITW with our CEO Steve Fogue. Particeep has been selected by Aéroports de Paris to participate in the French innovation action. This pitch video was broadcast on tablets made available in the trade fairs of Aéroports de Paris. Particeep selected to represent the Fintech sector and InsurTech to Viva technology. discover the video of Steve FOGUE, co-founder and president of Particeep. Particeep won the Attractive Innovation Prize organized by the city of Courbevoie on 22 September 2016. Steve Fogue, CEO of Particeep, guest of NEWSManagers TV’s "An Expert Talks" program, explains Particeep’s solutions for asset management companies. Crédit du Nord continues to bet on Open Banking by joining forces with the fintech Particeep. The group uses the Particeep API BankInsure in order to offer online real estate loan subscription. The group Crédit du Nord announces the creation of an API with the fintech Particeep in order to enable the online registration to real estate loans in less than 10 minutes. The CEO of Particeep, Steve Fogue, is part of the Asset Management Trophies jury for the second consecutive time that is organised by Funds et Option Finance, partnering with Deloitte and State Street. An infographic chart brought to you by the team of Particeep, underlining the digital importance and the reinforcement of the client’s relation with their wealth management advisors. Steve Fogue, CEO of Particeep, presents the solution Particeep Plug that aims at industrialising the online sale of banking and insurance products thanks to a line of code. Particeep is part of the 2018 French Fintech and InsurTech panorama launched by the consulting agency Klein Blue Partners. Particeep is listed in the category «Distribution service for Insurers and Brokers». Overview of the second edition of the Particeep Digital Tour event, held on May 30th, 2018 at the Palais Brongniart on the open banking and PSD2 topics. 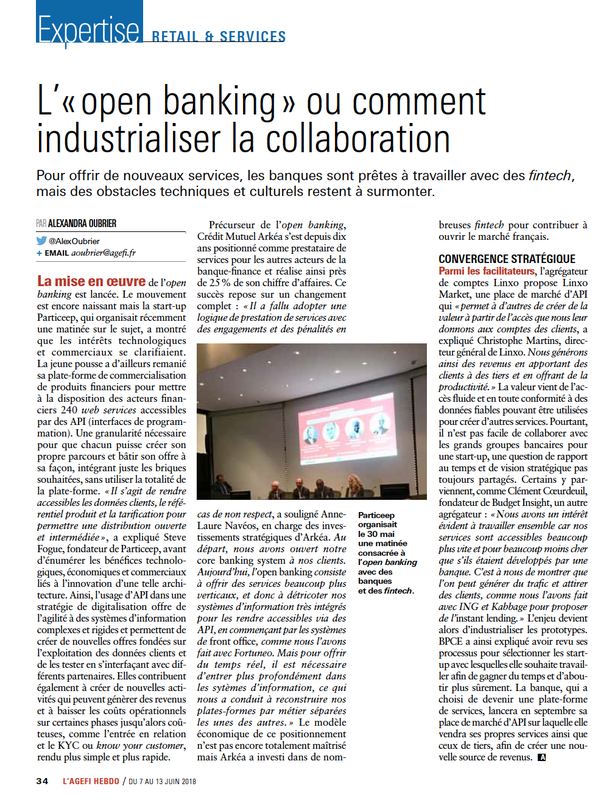 Intervention of Particeep, alongside BPCE, Crédit du Nord and Société Générale on the banking-as-a-platfom model, APIs, open banking and partnerships between banks and fintechs. Interview of Steve Fogue, CEO of Particeep on the open banking solution and its benefits for banks and their users. Half of the Particeep customer pipeline is composed of banks. Zoom of the Particeep strategy and API for financial product distribution. Analysis of the CEO and co-founder of Particeep, David Dumont, on open banking, APIs and their impact on the user experience. Focus on Particeep’s turnkey solutions for online distribution of financial products and services. Interview with Steve Fogue, CEO of Particeep, on online distribution solutions for white label financial services. Fintech Particeep is accelerating the digital transformation of financial services. The latest in this interview with Steve Fogue, CEO of Particeep. Edukys partners with Particeep and AXA Partners to offer a borrower insurance solution on its crowdfunding platform. Interview with David Dumont, COO of Particeep, on the Weapply.io solution which aims to create calls for collaborative projects very quickly. Interview with CEO and co-founder of Particeep, Steve Fogue, on Particeep’s online financial services solutions. Interview with Steve Fogue, the purpose of Particeep and the challenges of digitalization of financial services. Vatel Direct relies on the Particeep solution to launch a bond financing platform dedicated to CGP, corporate treasurers. Feedback on the event Particeep Digital Tour organized on 6 April 2017 at the Palais Brongniart, on the digitization of asset management. The success of the first edition of the Particeep Digital Tour on the digitization of asset management explained. Feedback on the event Particeep Digital Tour organized on April 06, 2017 on asset management facing the challenges of digitalization.